They say nothing stays same like if you keep a table in a room and lock it and visit that room after a few years, the table will not be in the same shape. Same goes for cultures, norms, and mindsets. As the world is introduced to new terms and theories it not necessary that it will stay the same. There is always going to be someone who’ll come and research and maybe bring some more changes in that original set of theory! So, a decade back or maybe two-decade back people believed some professions to be indecent for women. Like being an air hostess, modeling, acting or working in a corporate system. These were the most unlikely professions which a woman chooses, the rights ones were always said to be either teaching or becoming a doctor. Women were not allowed to experiment by working in any of the diverse and creative fields, but things change. And it did, it did in a way that it changed the way people use to see things. Now we see one of the best women architects, one the best female CEOs, the best town planners and all the other fields that were previously men dominated! But even after all the struggles and pain that women went through to make this thing possible and get it into the brains of people to see it as an “acceptable” thing. Here are all these people who are bashing these small kids for walking on the ramp! 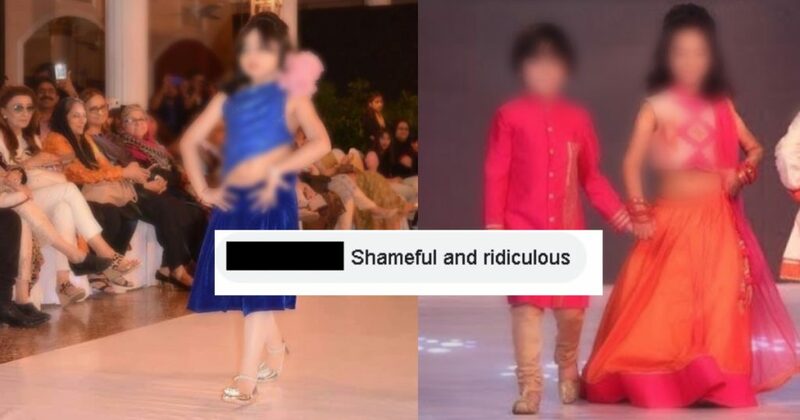 People are abusing this small kid and even her parents who “allowed” her to walk on the ramp. Bashing a mere kid and calling it an act which is ruining the society?! Are these people even for real?! This is exactly the same kind of behavior where people in general call the victim wrong but not that culprit. People said that this kid’s dressing is the reason why all the bad things are happening to kids. Seriously? Okay, but what about the time when a 90-year-old wheelchair bound lady is mistreated? When a 6-month-old kid is mistreated? They were not the ones to wear any such clothes or do a ramp walk. The problem is not these innocent kids, but the people who believe it to be wrong. Wow! So these kids are wrong, not the ones who commit the crime? And not because why people do wrong to the innocent kids? Mentally retarded are the ones who are accusing these kids! No? Maybe scroll up and avoid if it’s this shameful! What do you guys think about this? Do you have anything to add to the story? Let us know in the comments below!